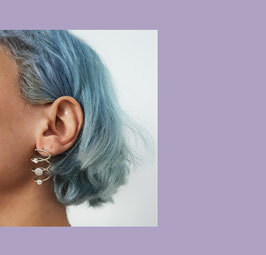 Ettia earrings have strong character and they make a statement. 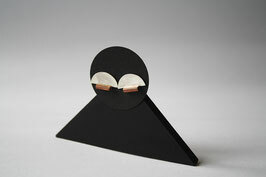 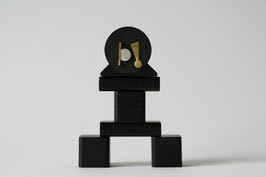 An accent piece for any kind of occasion, with a contemporary look. 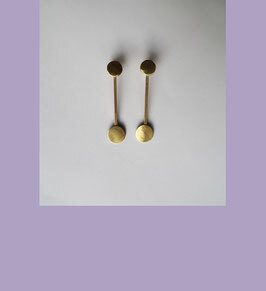 Brass with recycled sterling silver elements. 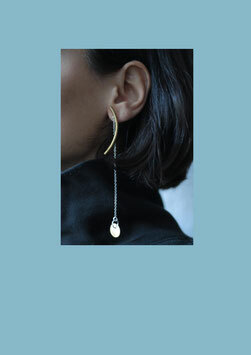 Mismatch statement earrings, juxtaposing shapes and materials, while creating strong visual expression. 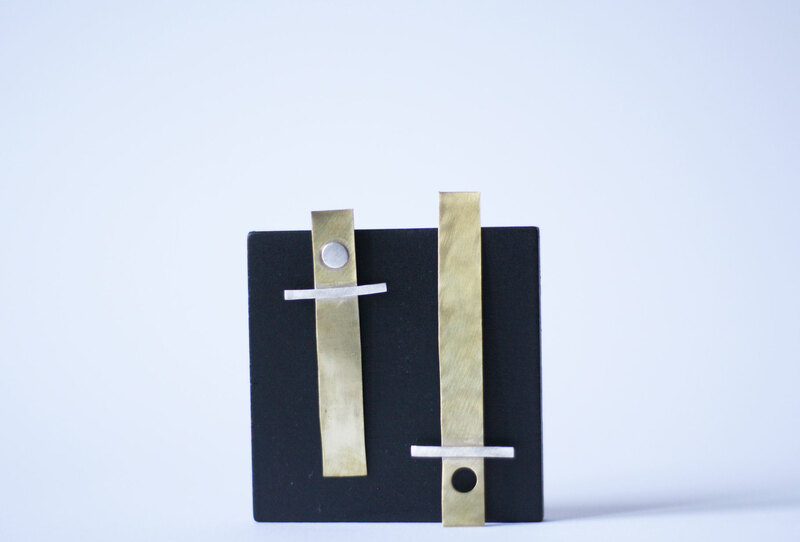 Brass with recycled sterling silver. 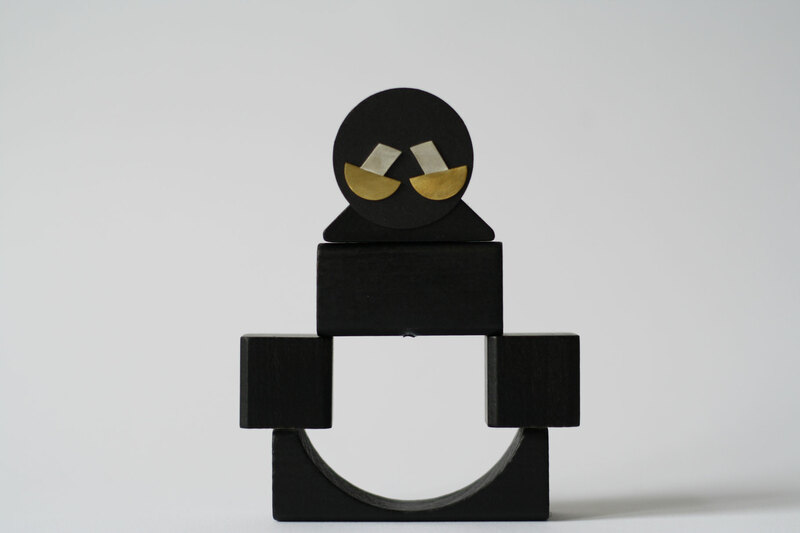 Dimensions: Length 59 mm , 31 mm. 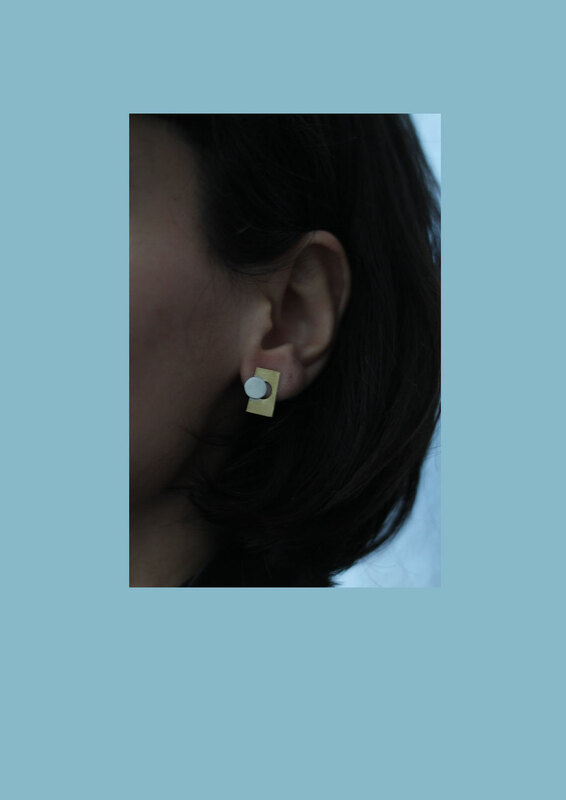 Iota earrings are the first pieces of the collection spontaneously created without any sketching, in the process. 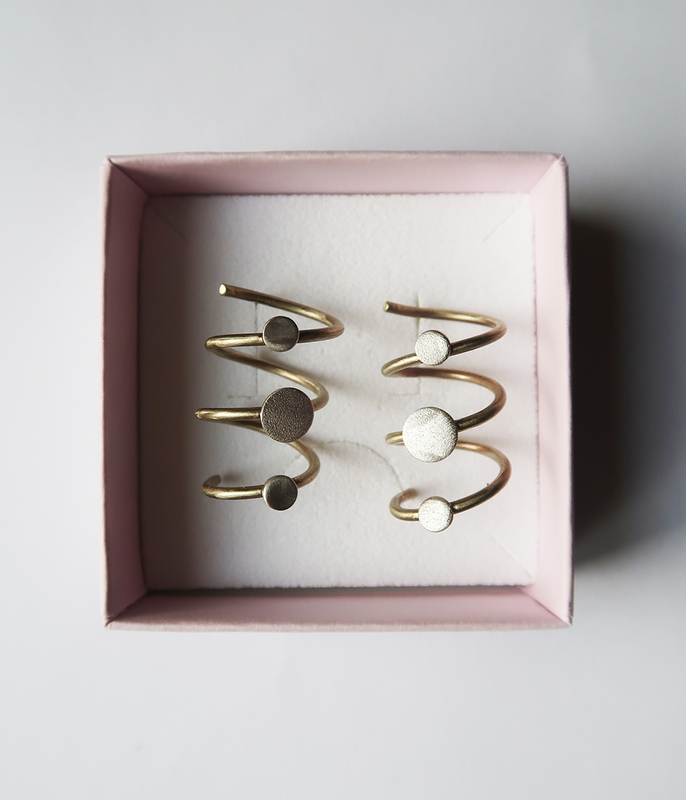 The shape is completely intuitive, therefore each of them is one of a kind, there will never be exact copy of Iota collection pieces. 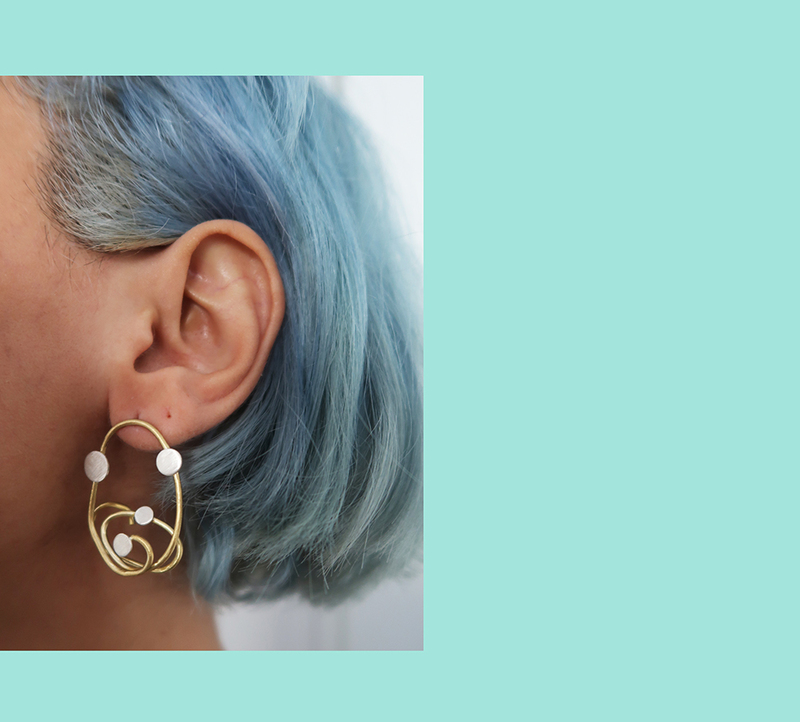 Merging the brass wire with recycled sterling silver circles, creating organic, abstract shape that carries classy, yet modern look, which could be suited to every kind of outfit and mood. 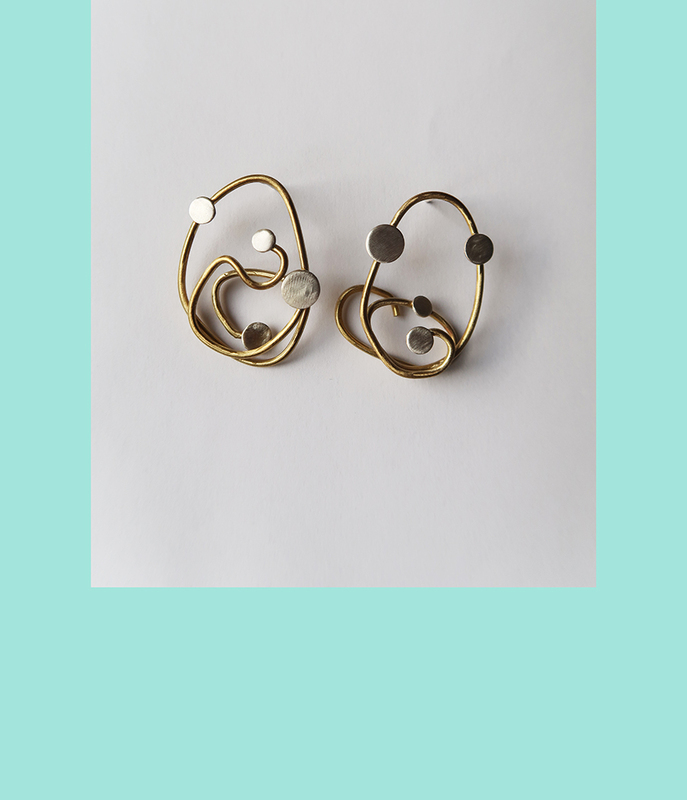 Silver circles come together with brass curve to create effortless declaration of modern elegance. 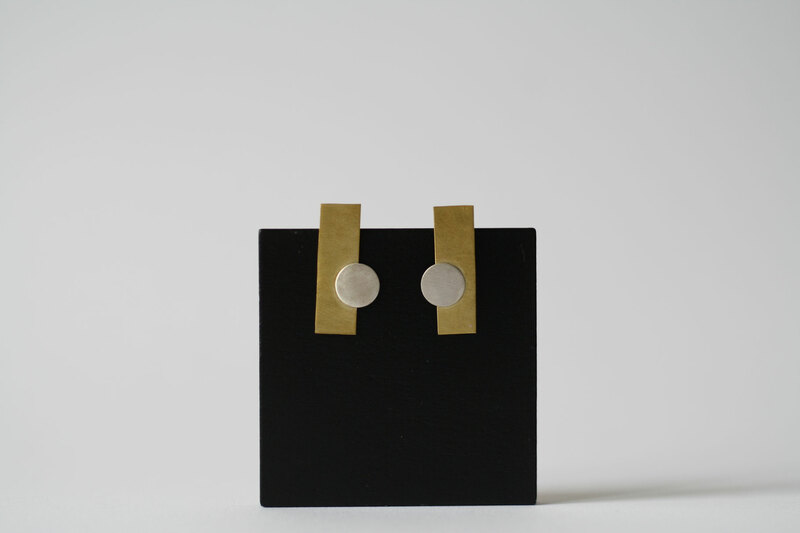 Recycled sterling silver and brass. Brass spiral with silver circles that playfully sits on the ear. 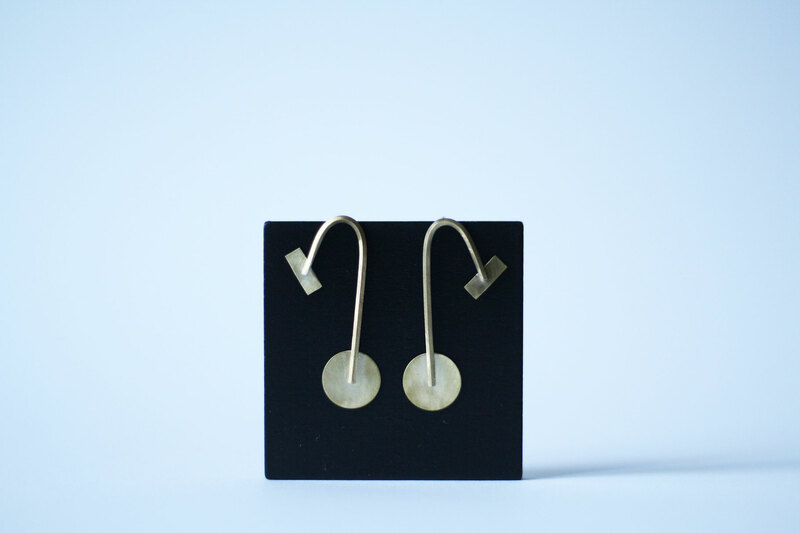 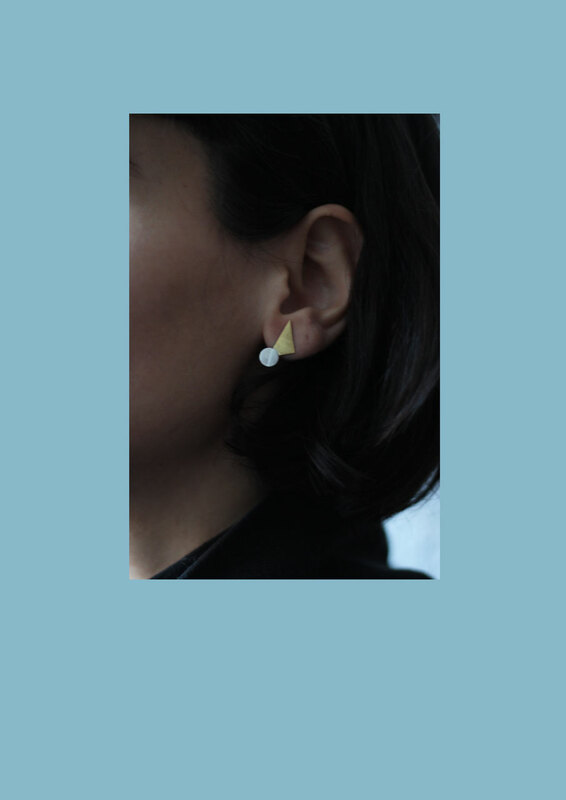 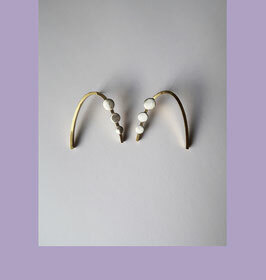 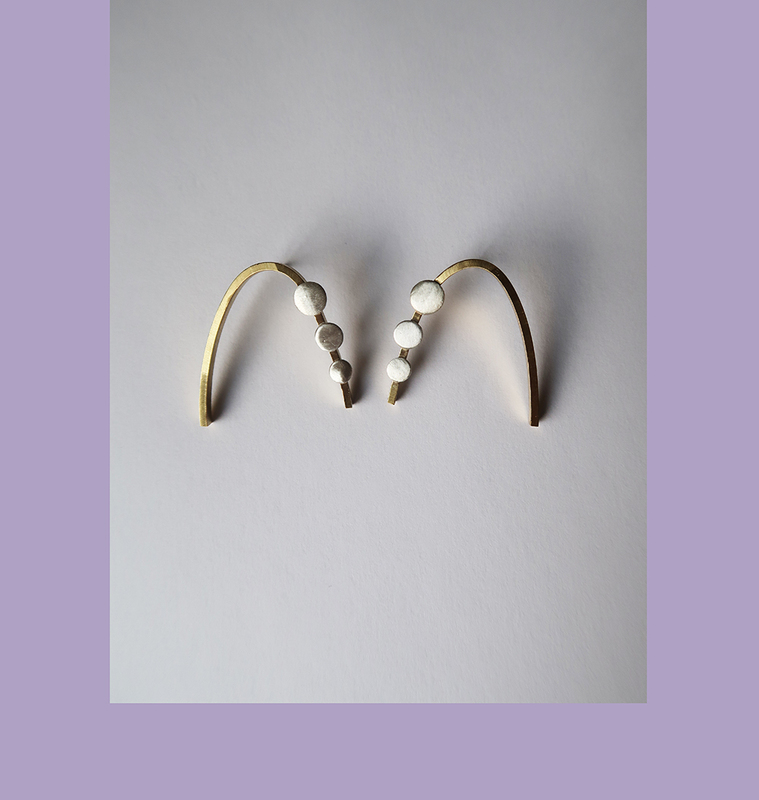 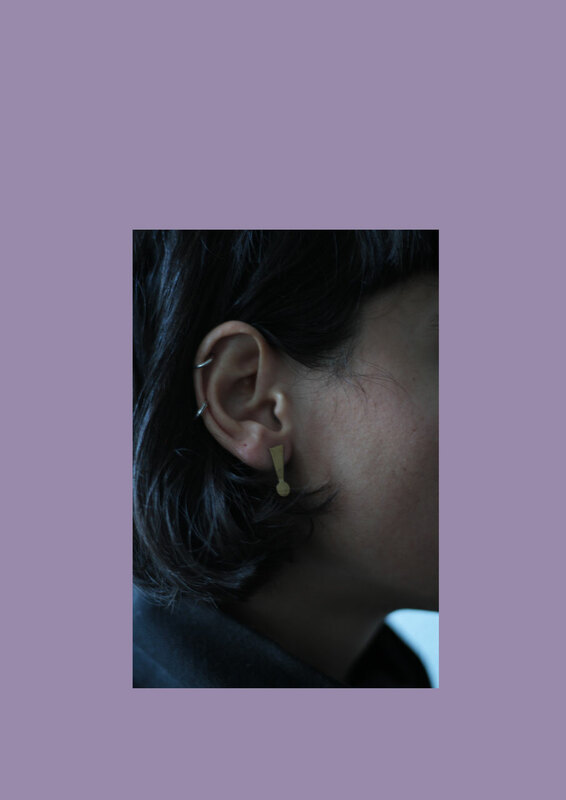 Elegant brass earrings, inspired by minimalist shapes and modern, clean lines. 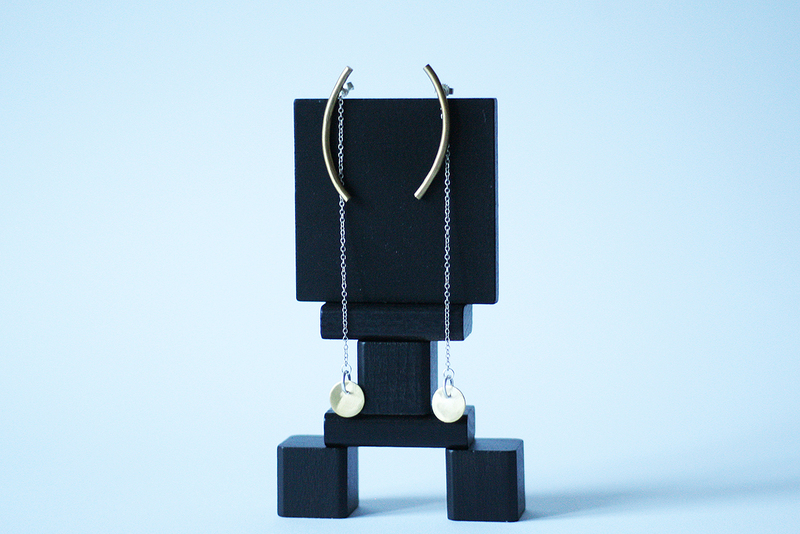 One of a kind piece, created in the process, without a plan and a sketch. 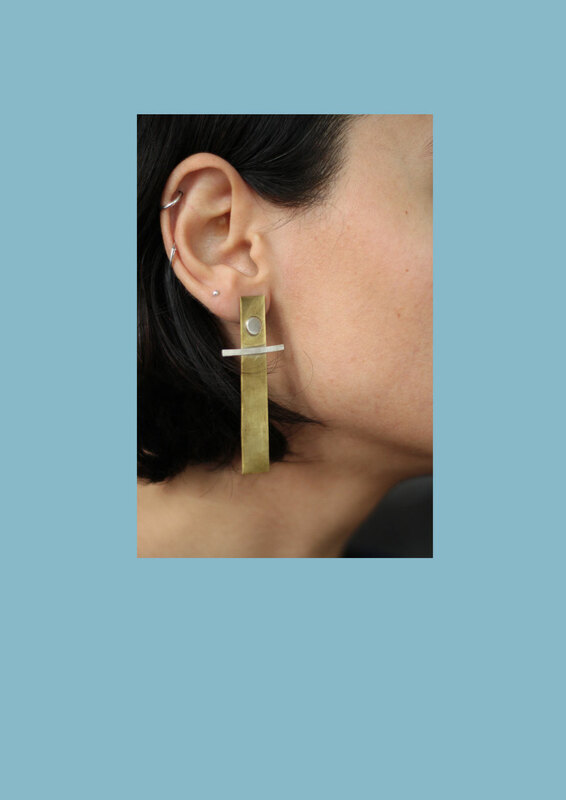 Brass and recycled sterling silver. 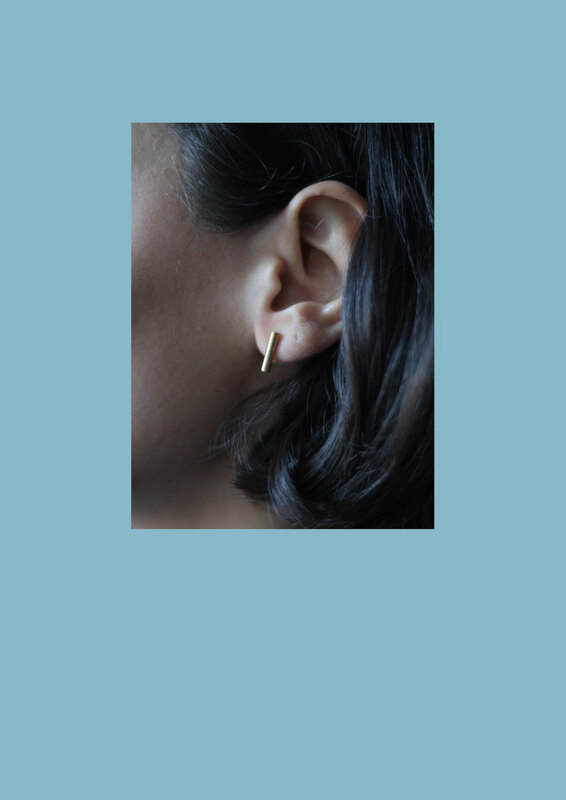 Dimensions: Length 22 mm, 18 mm. 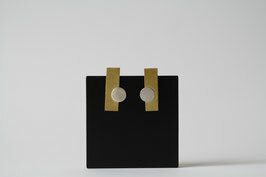 Flappy Earrings contrasts materials and shapes, creating elegance. This piece is one of a kind. 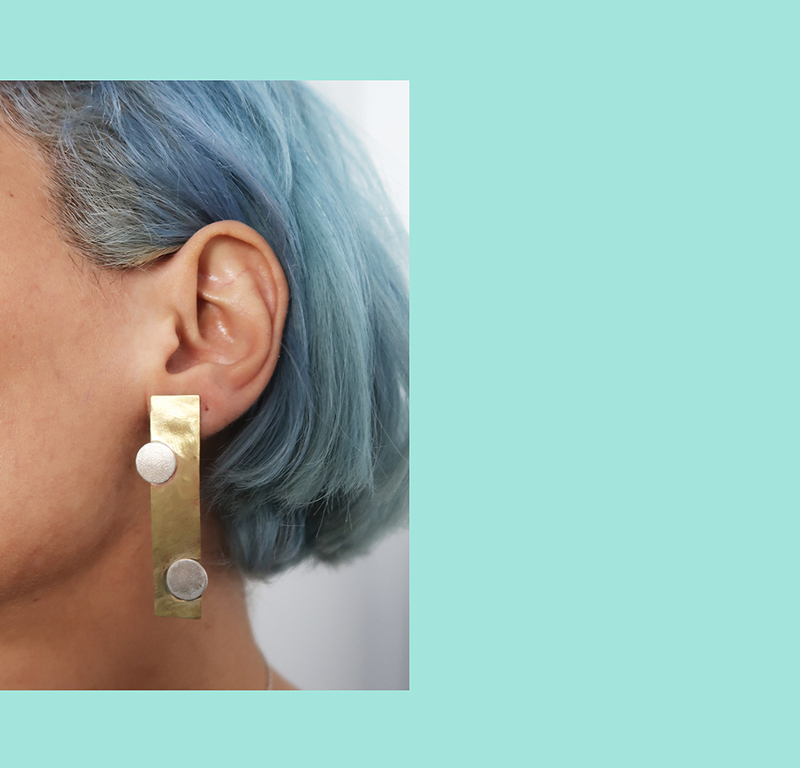 Silver is recycled from the old tableware, giving it a new life. 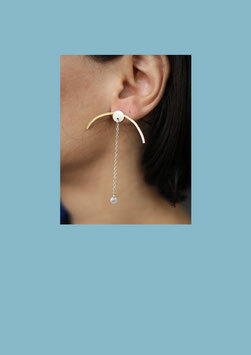 Mismatch earrings are the playful ones, with different shapes and combinations. To be worn together or separately. 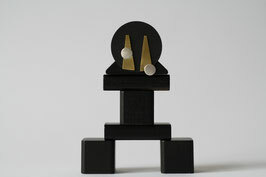 This piece is one of a kind. 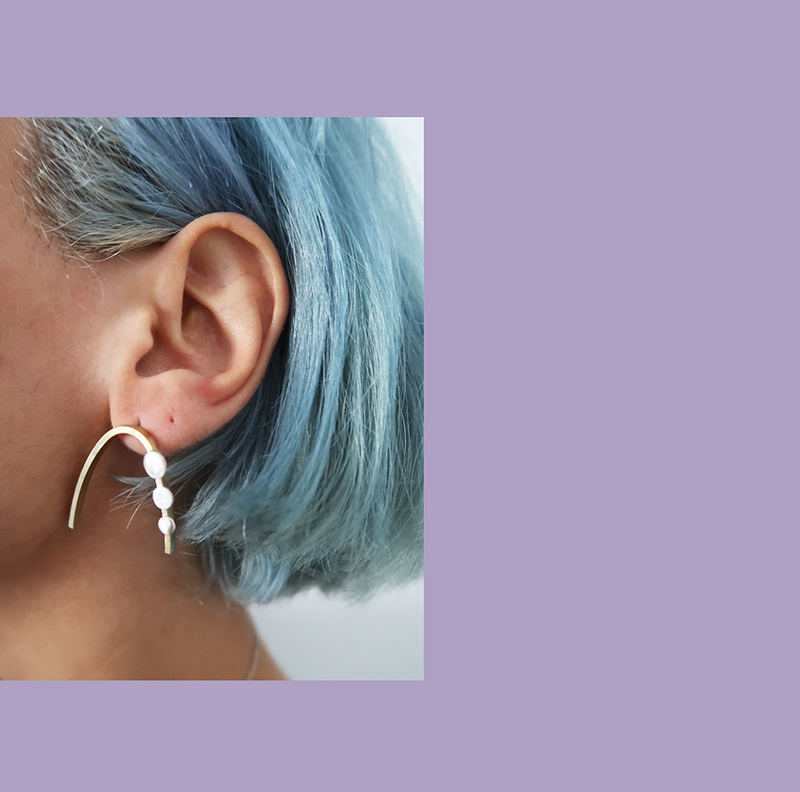 Silver is recycled from the old tableware, giving it a new life. 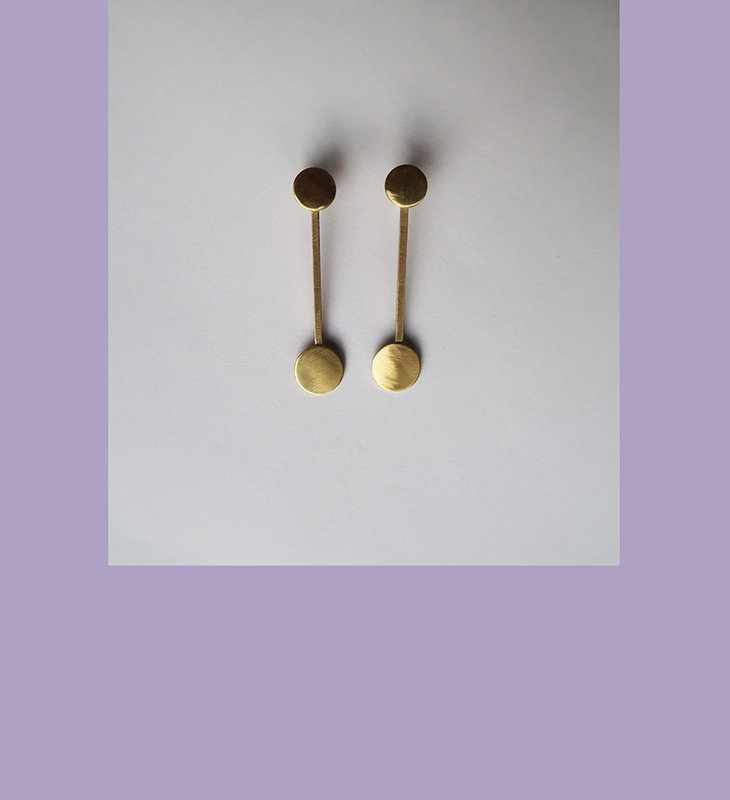 Simple, mismatched earrings with sterling silver and brass. 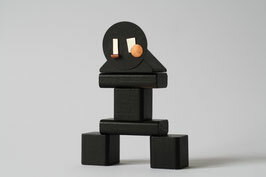 This piece is one of a kind. Dimensions: 10 mm x 20 mm. 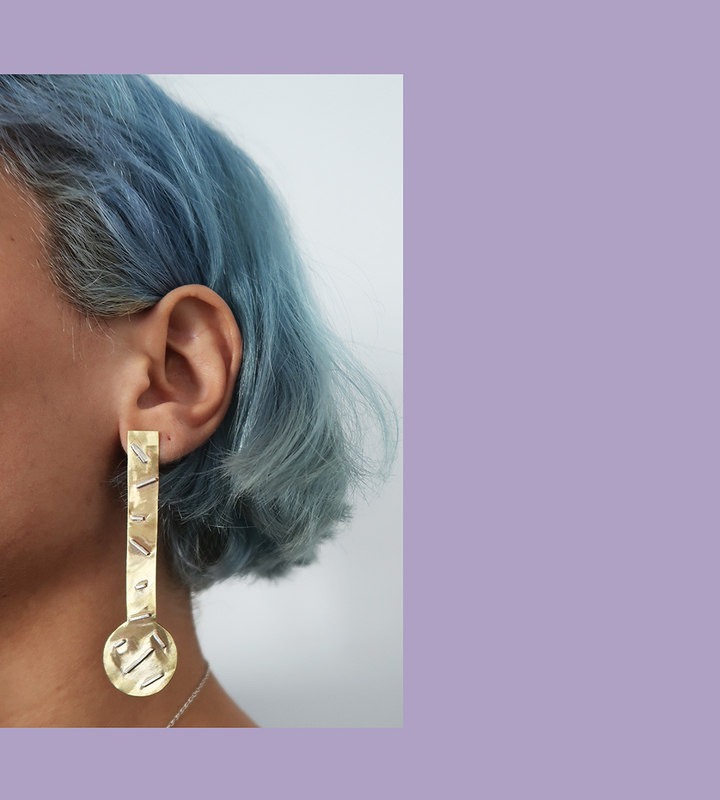 Care: It is a natural process for silver,brass and copper to darken and loose the shine over time, you could polish the silver surfaces with a polishing cloth or wash it with a mixture of baking soda and water, the copper surfaces could be polished with a mixture of salt and vinegar. 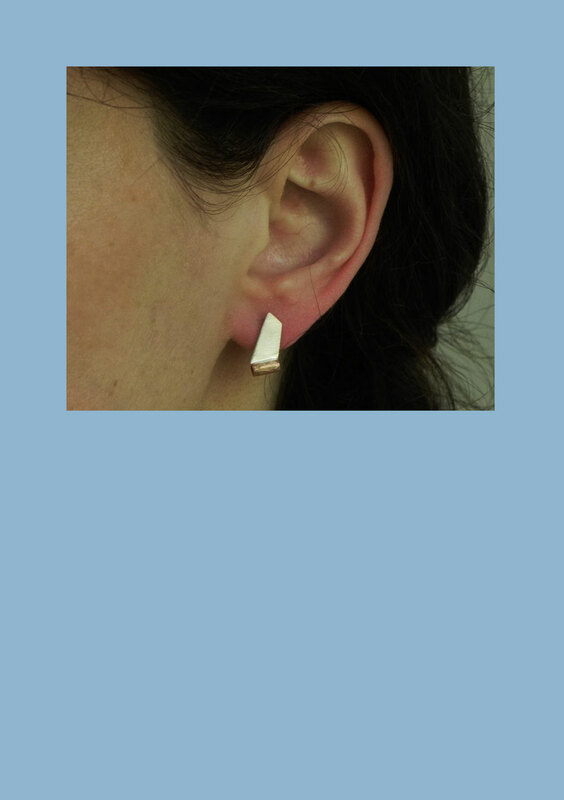 Dimensions: 14 mm x 16 mm. 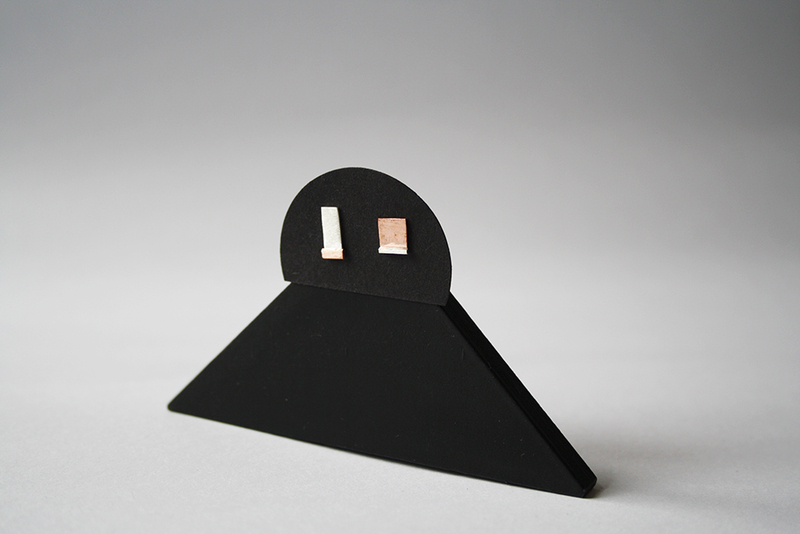 Dimensions: 11 mm x 15 mm. 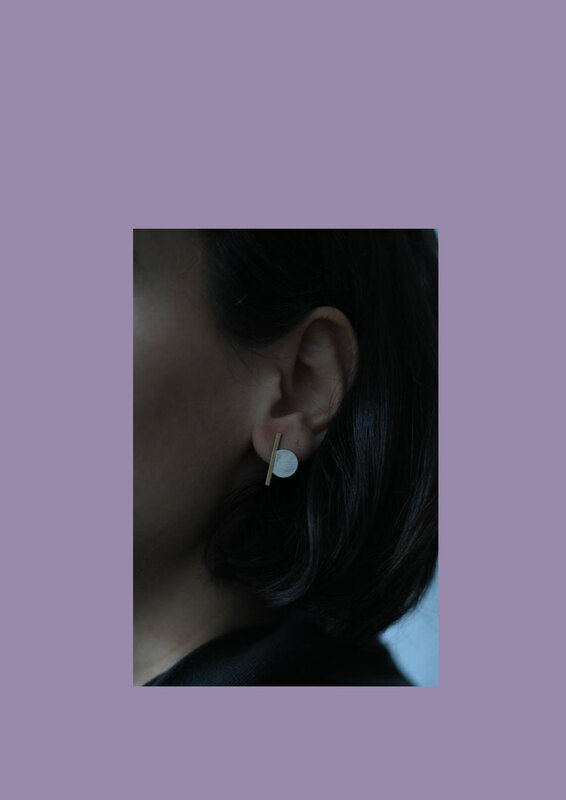 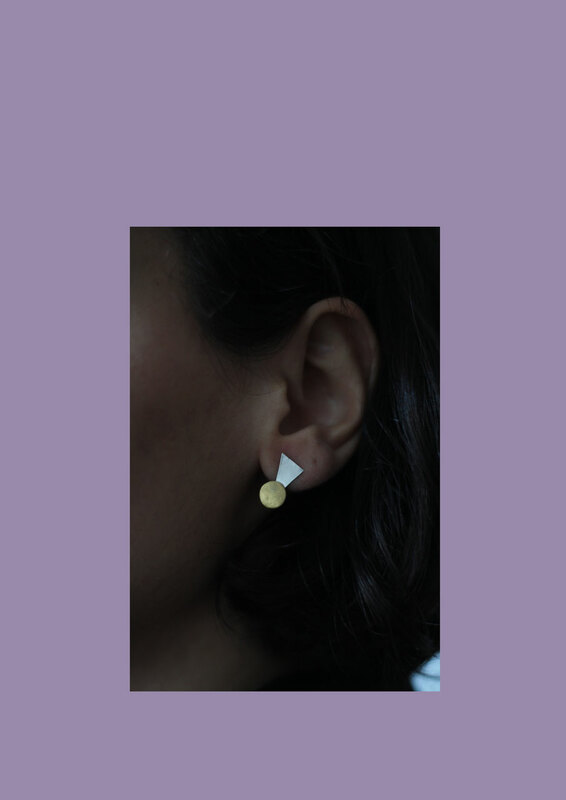 Minimalist earrings with geometric shapes. This piece is one of a kind. 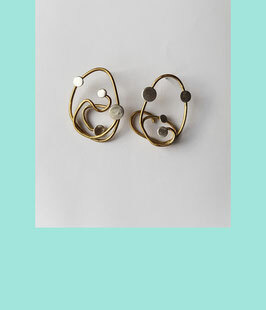 Silver is recycled from the old tableware, giving it a new life. 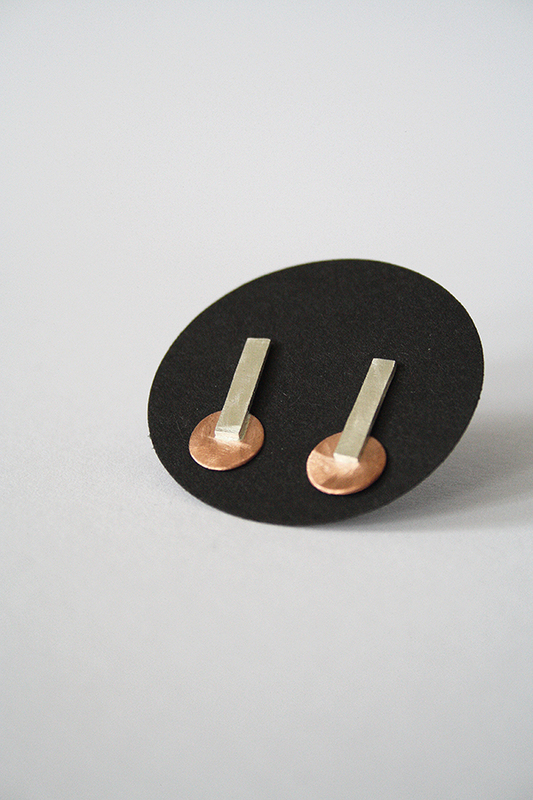 Small, simple earrings with silver and copper. This piece is one of a kind. 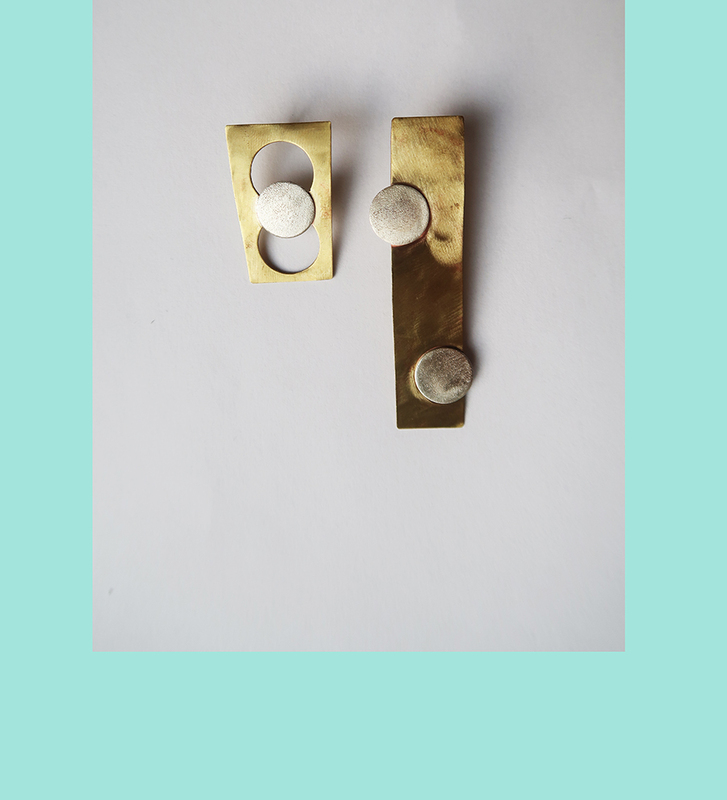 Silver is recycled from the old tableware, giving it a new life. 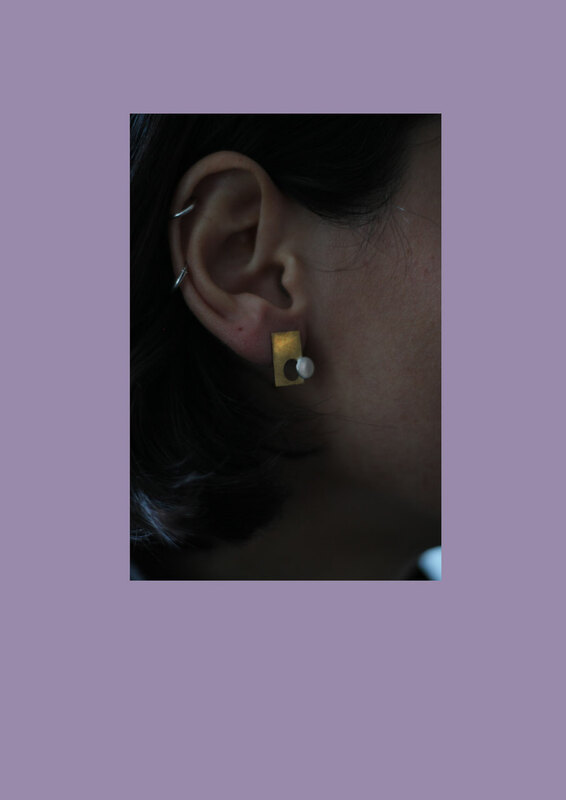 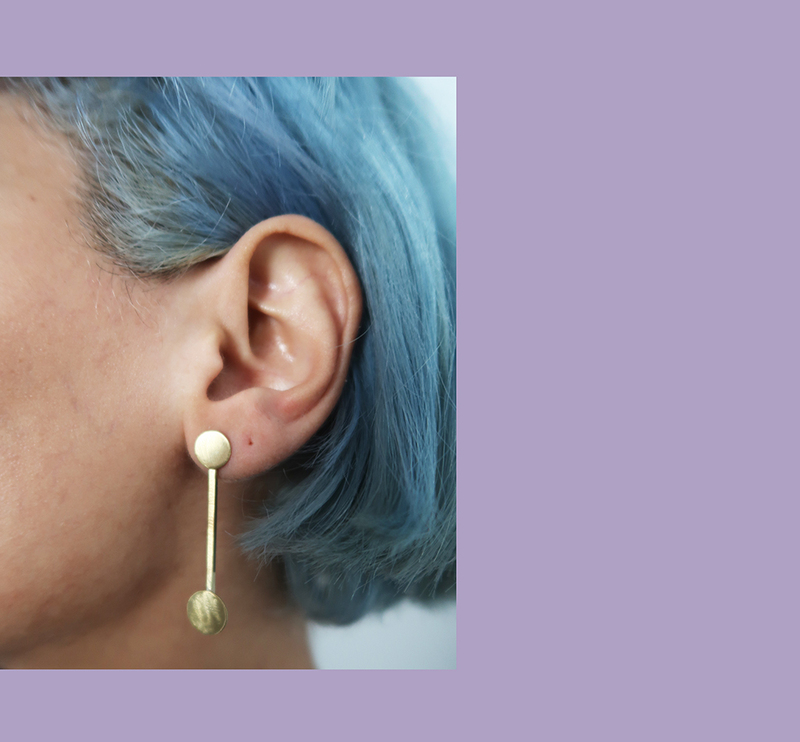 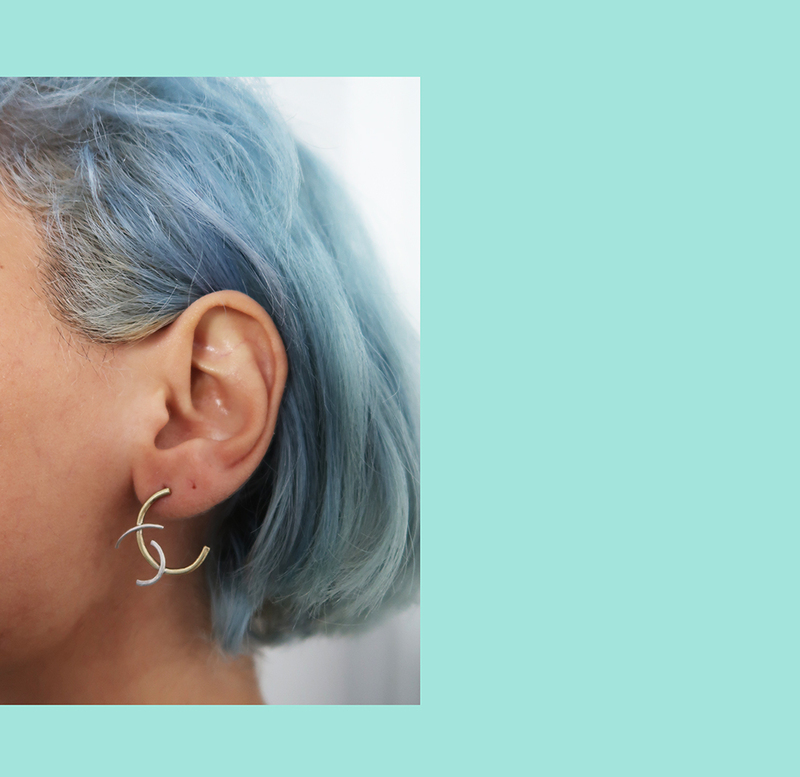 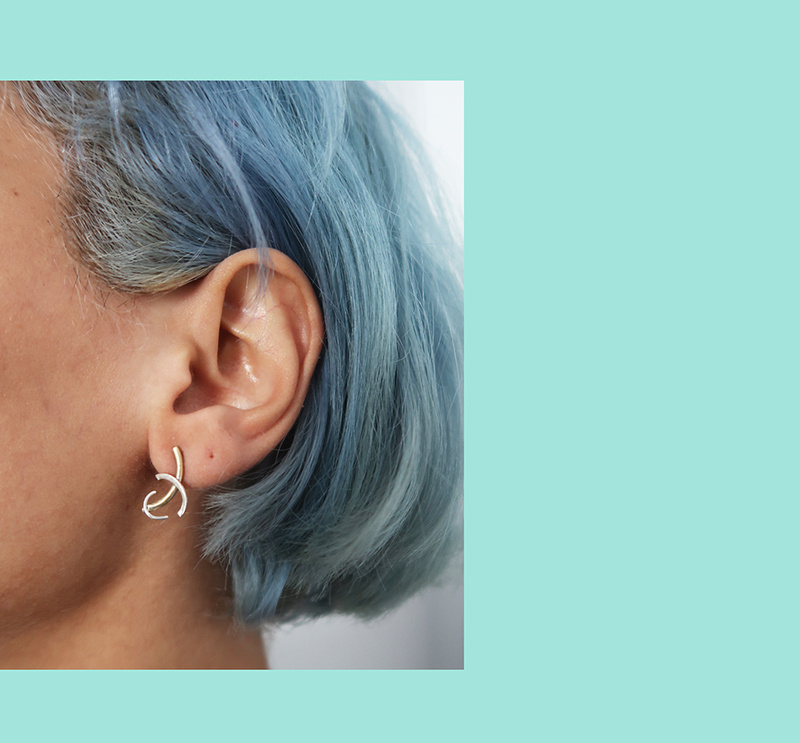 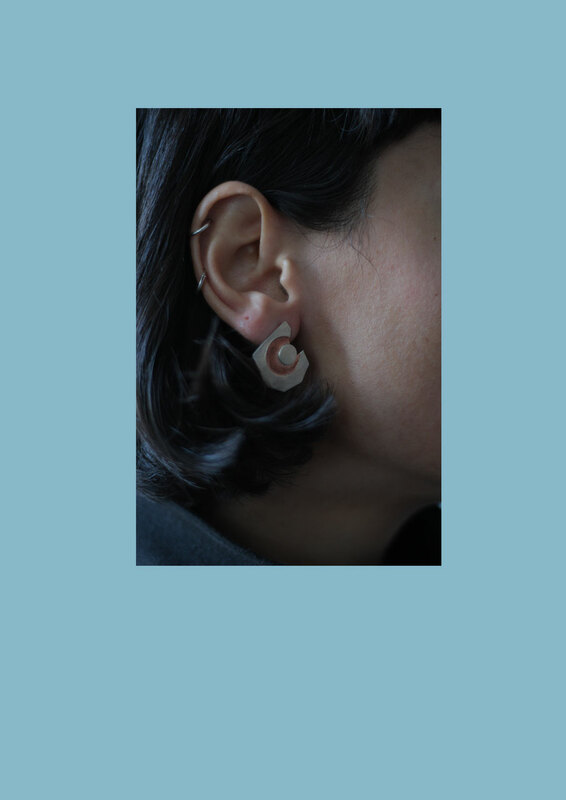 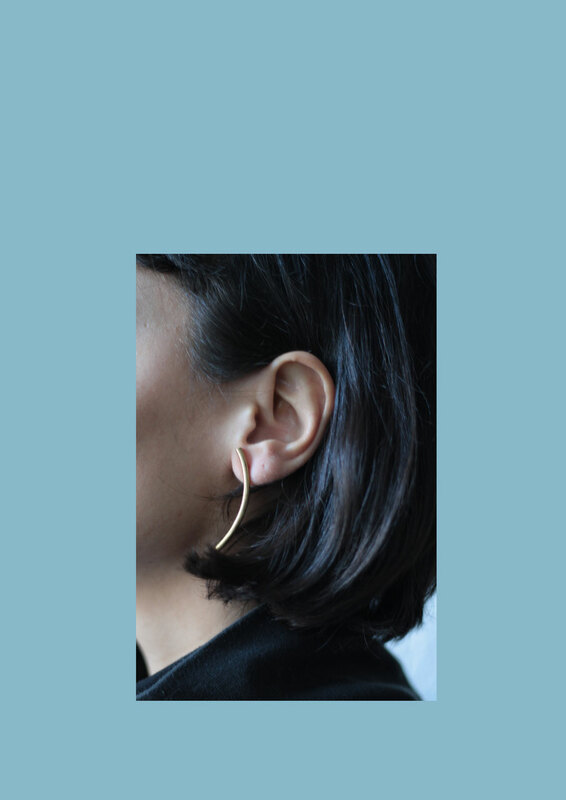 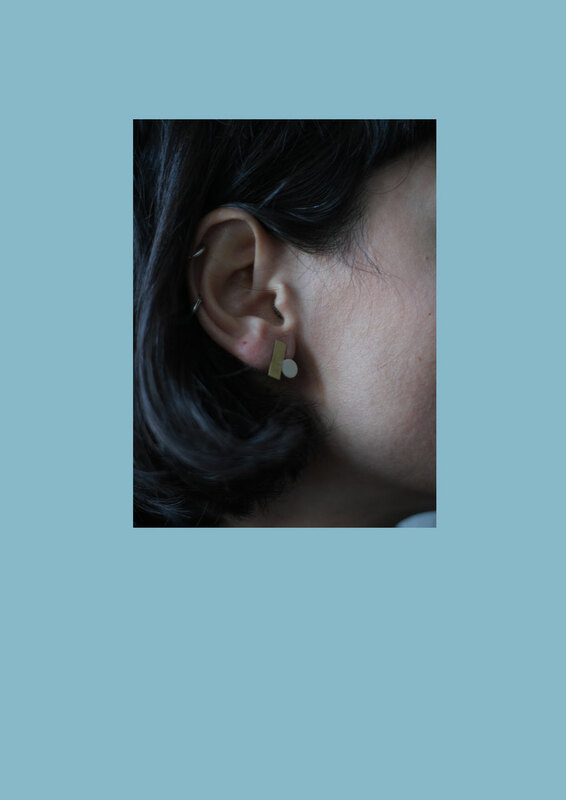 Ally earrings combines flat and tubular surfaces, creating simple yet full of character jewelry. 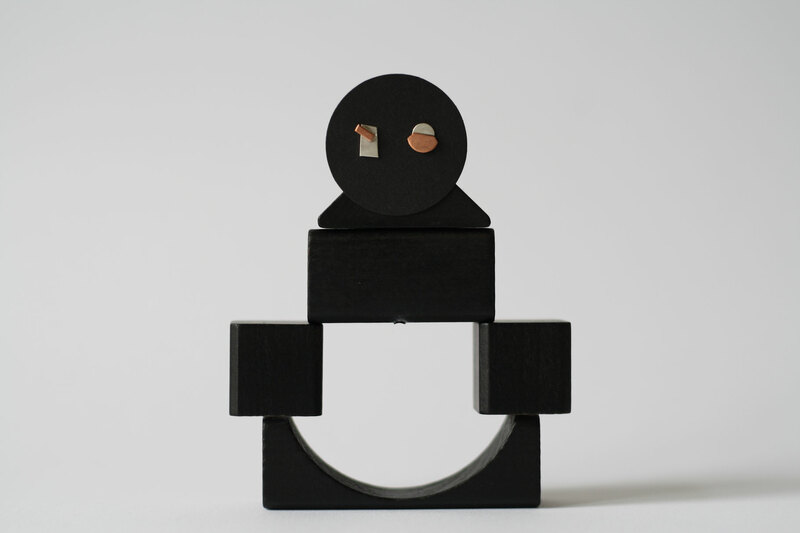 This piece is one of a kind. 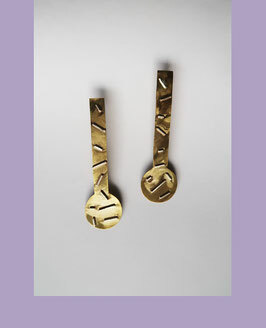 Silver is recycled from the old tableware, giving it a new life. 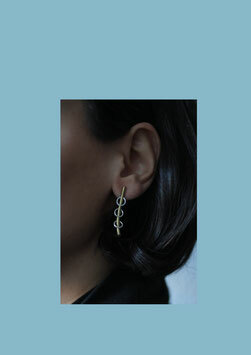 Curve earrings combine simple brass shape with a removable sterling silver chain detail. 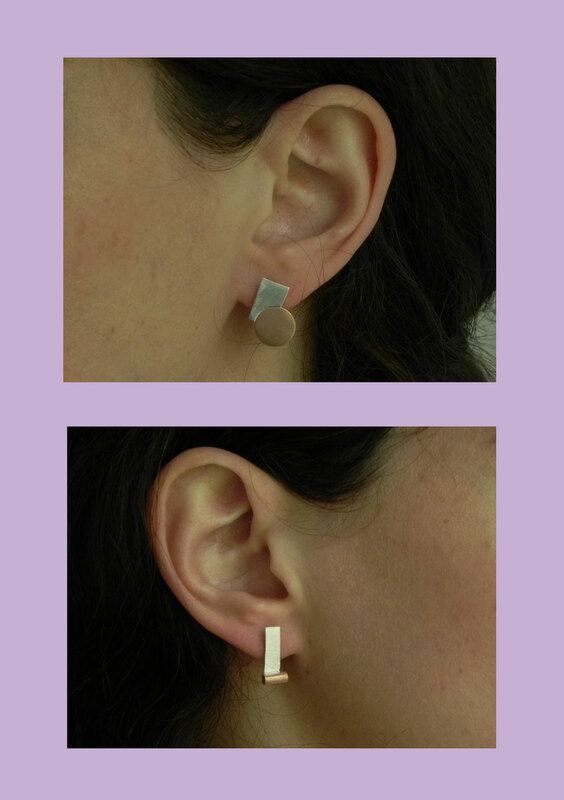 The earrings could be worn in two different ways, with or without the chain detail. 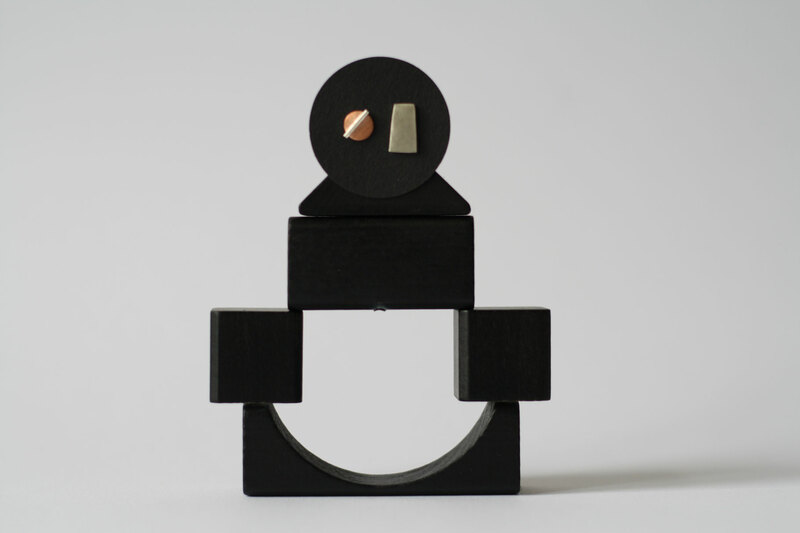 This piece is one of a kind. 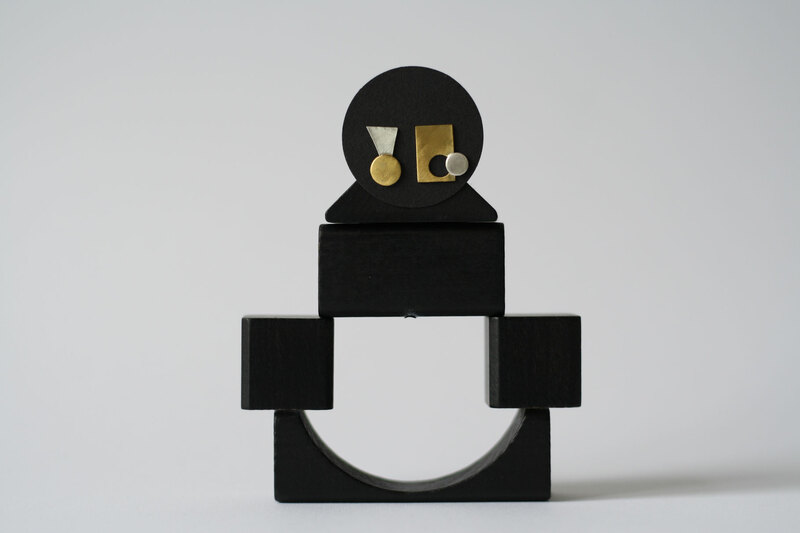 Dimensions: length of the brass 45 mm. 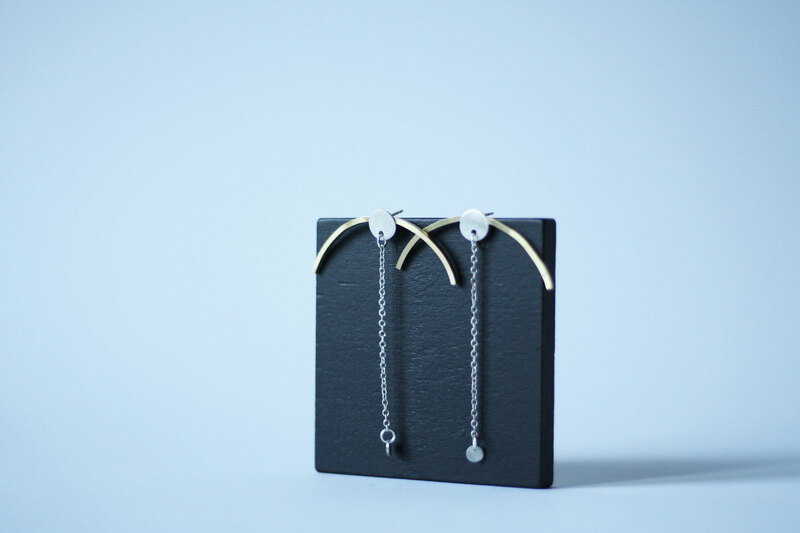 Length with silver chain 120 mm. Minimalist earrings with a detachable chain. 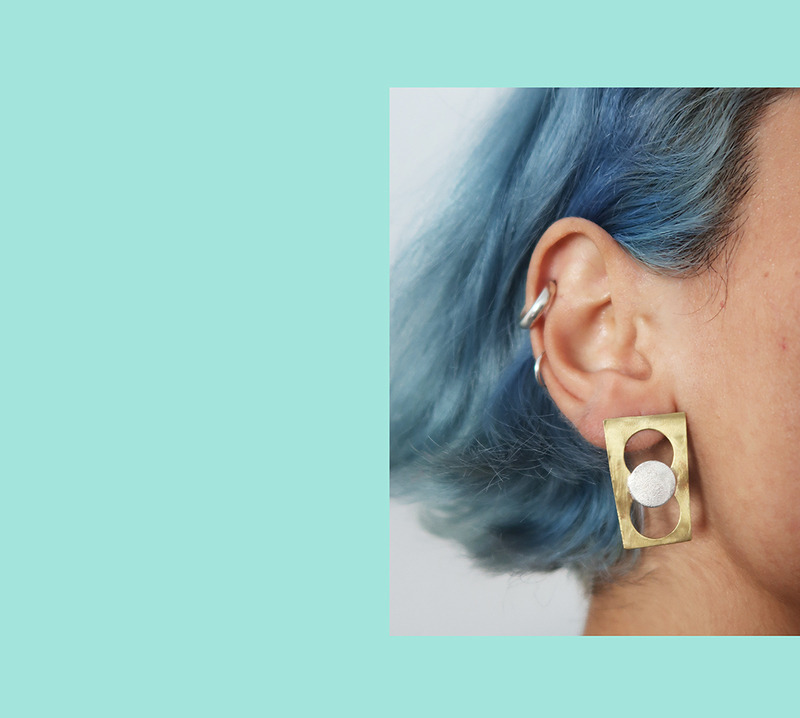 Eye earrings mixes brass and silver to create statement jewelry piece. This piece is one of a kind. 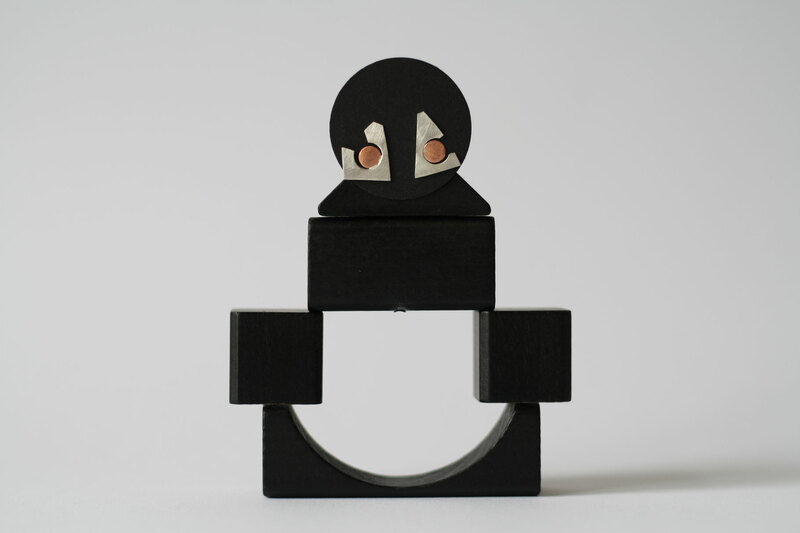 Dimensions: width 45 mm. 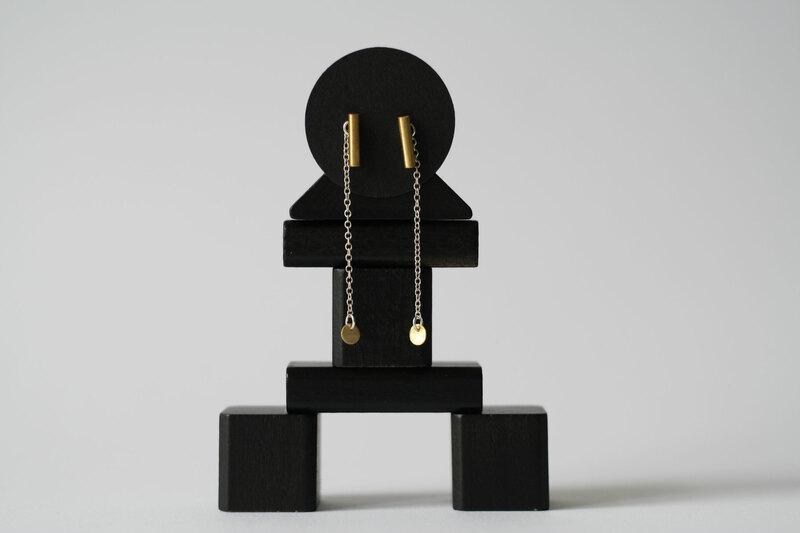 Length with silver chain 65 mm. 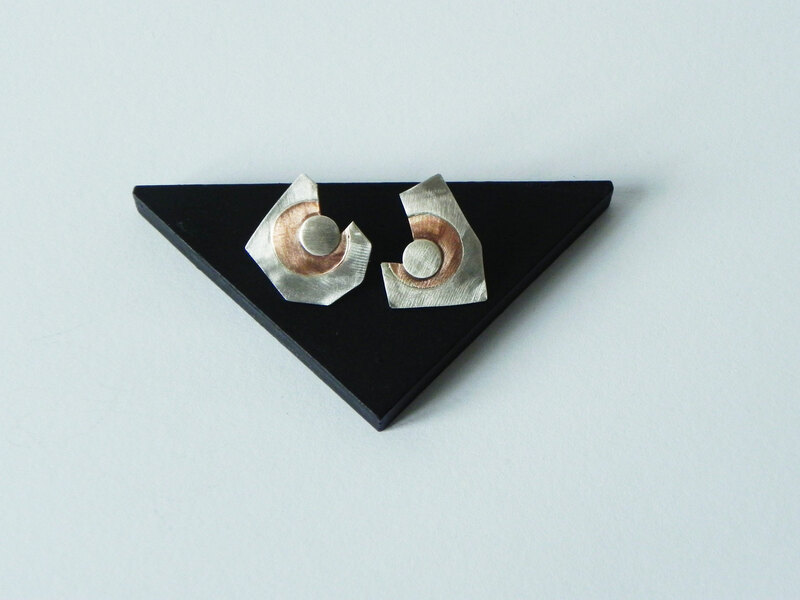 Mismatched earrings playing with shapes and surfaces, mixing sterling silver and copper. This piece is one of a kind. 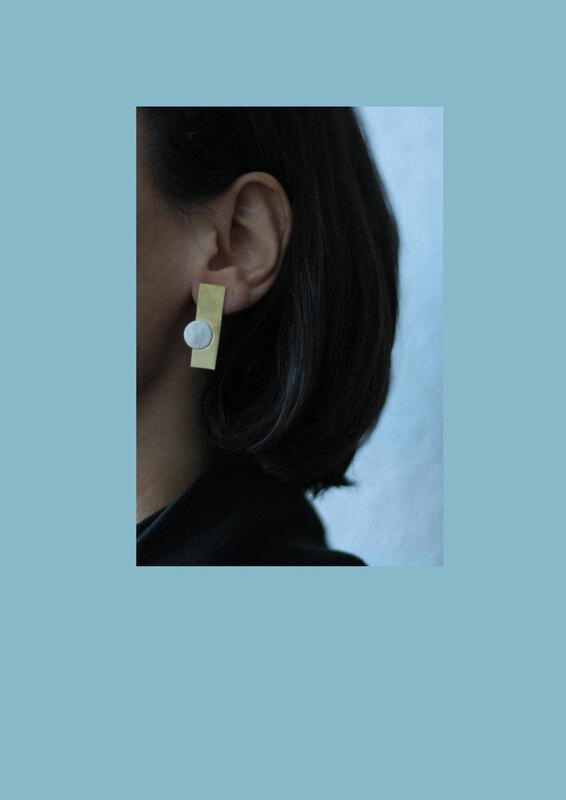 Playfully mismatched statement earrings, mixing sterling silver and brass. This piece is one of a kind. Dimensions: 10 mm x 80 mm, 10 mm x 64 mm. Care: It is a natural process for silver,brass and copper to darken and loose the shine over time, you could polish the silver surfaces with a polishing cloth or wash it with a mixture of baking soda and water, the copper and brass surfaces could be polished with a mixture of salt and vinegar. 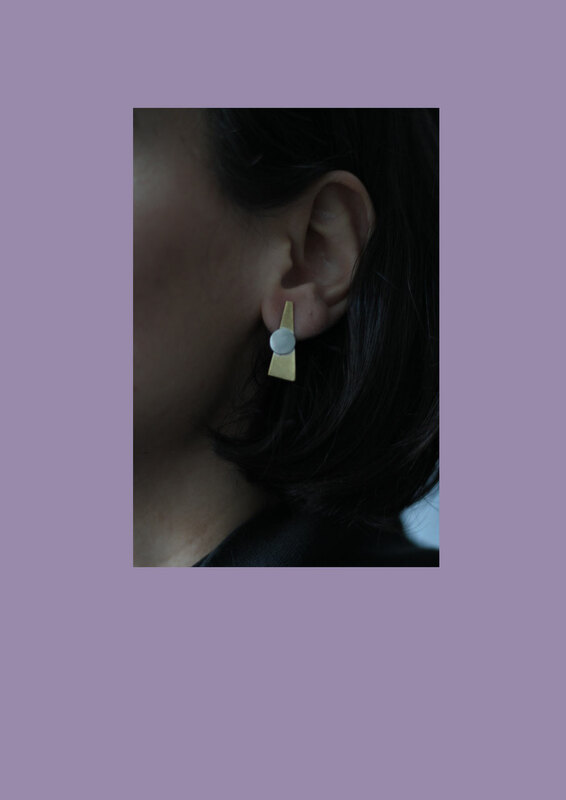 Geometric, minimalist earrings with brass and silver, creating modern elegance. This piece is one of a kind. 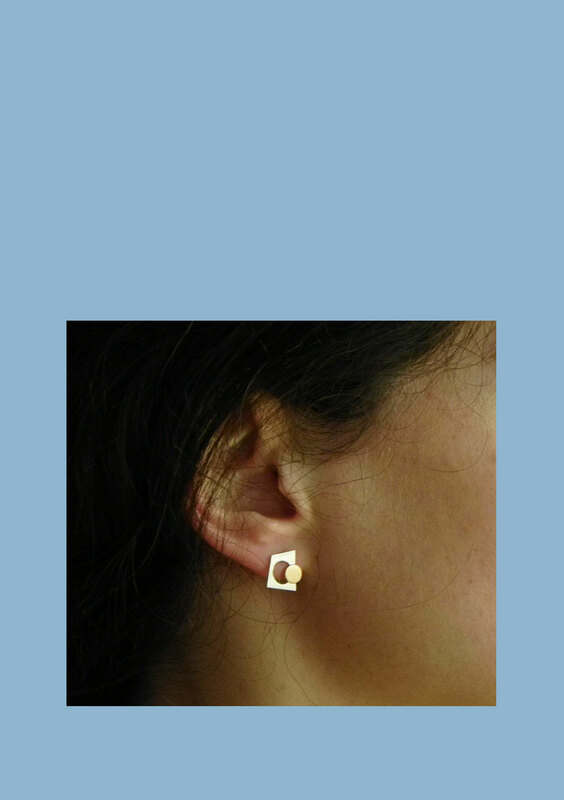 Dimensions: 12 mm x 12 mm. 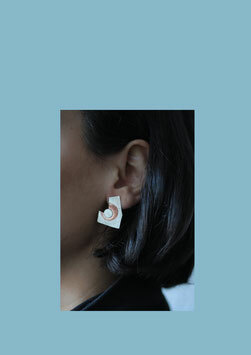 Ong earrings are modern and elegant statement pieces, inspired by geometry. This piece is one of a kind. Dimensions: 16 mm x 33 mm. Unique, statement brass earrings. 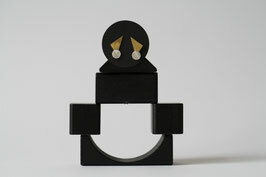 This piece is one of a kind. Dimensions: 22 mm x 52 mm. 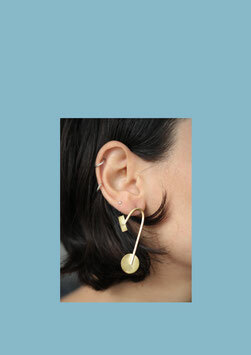 Unique, statement earrings. 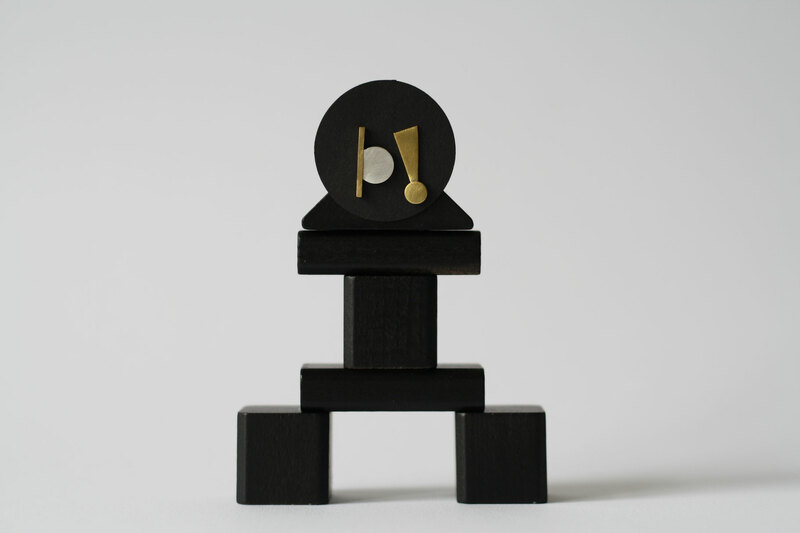 This piece is one of a kind. 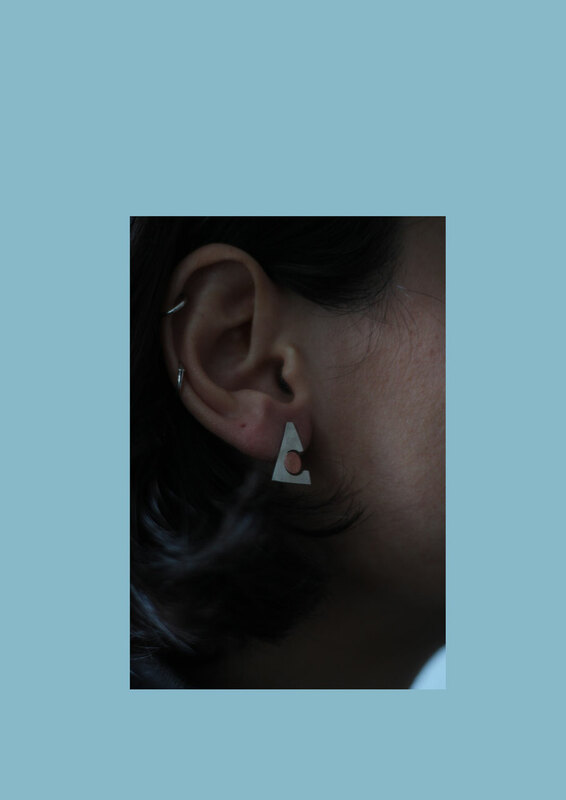 Slightly mismatched earrings, with clear geometric shapes. Mixing sterling silver and brass. This piece is one of a kind. 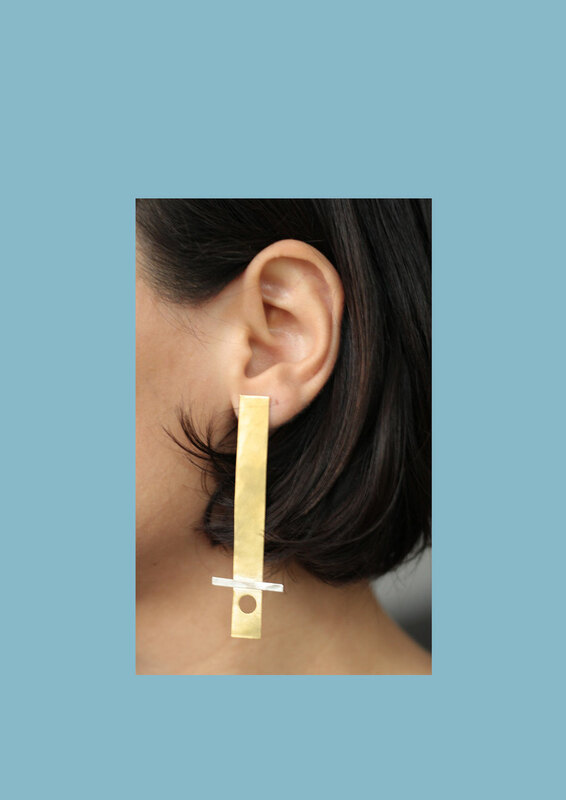 Unique, minimalist earrings with sterling silver and brass. This piece is one of a kind. 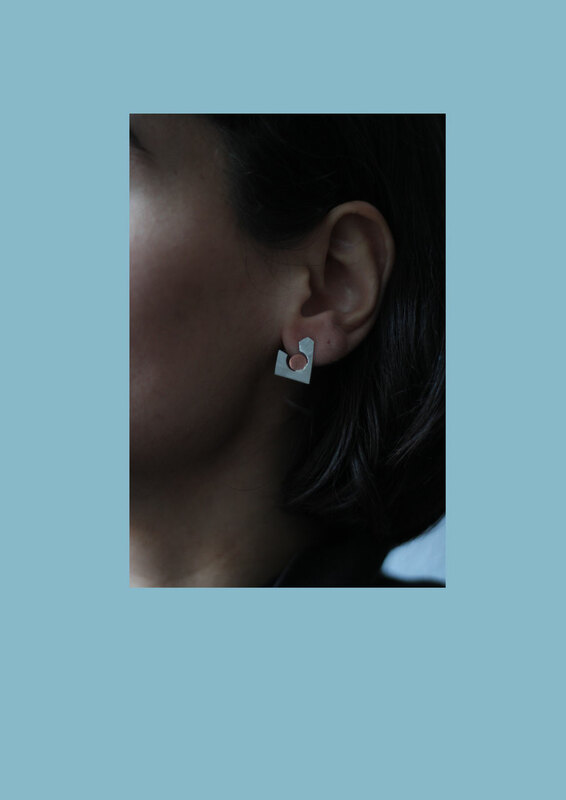 Minimalist earrings with a detachable sterling silver chain detail. 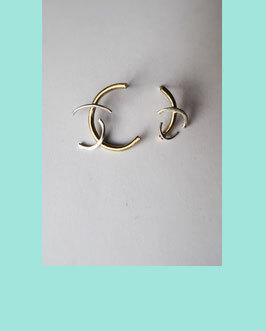 To be worn together or separately. This piece is one of a kind. Dimensions: length of cylinder 13 mm. Length with the silver chain 58 mm. Minimalist earrings, mixing sterling silver and copper. This piece is one of a kind. 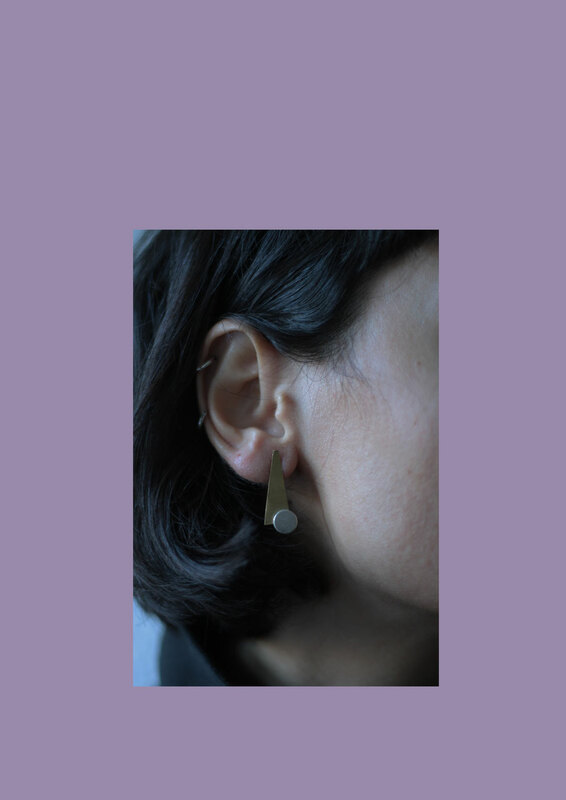 Simple earrings playing with texture and shapes, mixing sterling silver and brass. This piece is one of a kind. 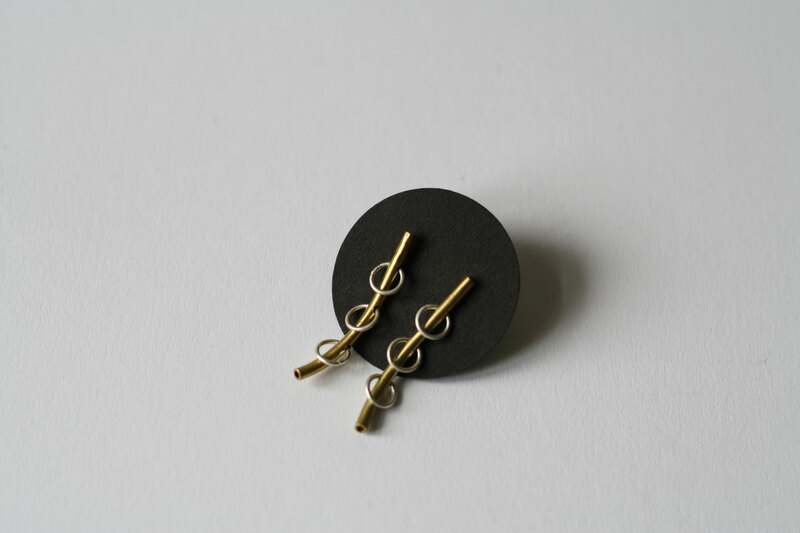 Dimensions: 10 mm x 13 mm.